Karen Campblin, Co-Chair of the Green New Deal Coalition (left), April Moore, candidate for Virginia Senate (center), and Bob Shippee, Legislative Chair of the Sierra Club Virginia Chapter. 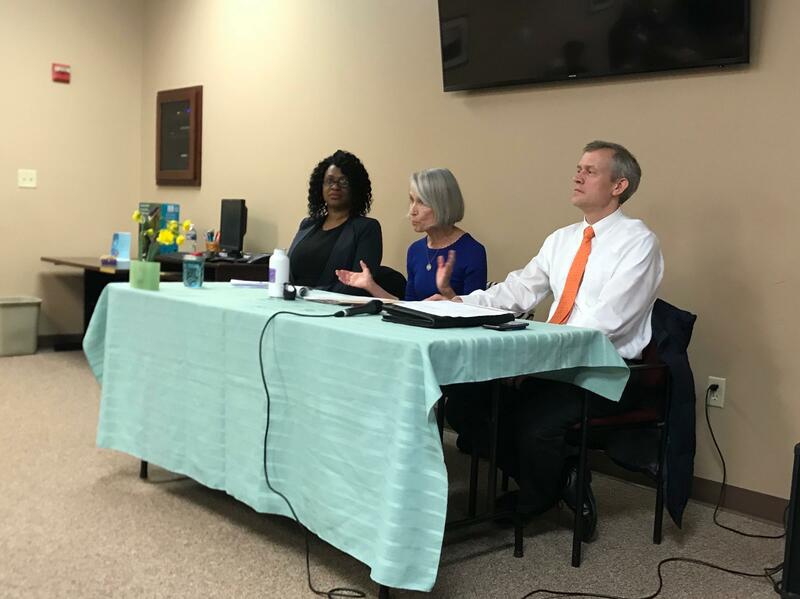 Wednesday night [March 20], Climate Action Alliance of the Valley held a panel to talk about the need for climate legislation in Virginia. The panel featured climate activists and local state Senate candidate April Moore. WMRA’s Anna Saunders reports. Last’s night’s panel, titled Wake Up Virginia!! !, addressed the Virginia Green New Deal, clean energy and ways voters can encourage climate change policy. April Moore, who is challenging Virginia Senator Mark Obenshain for the 26th district seat, said climate change is her number one platform. APRIL MOORE: I say that climate change is the issue of our time. And it’s the greatest challenge humanity has ever had to face. It affects everything. Sitting on the panel with Moore was co-chair of the Virginia Green New Deal, Karen Campblin. Campblin said that only two legislators have signed on to the Virginia Green New Deal. Moore said she is unsure whether she will sign on. MOORE: I really like the Green New Deal in that it is big. Because we need big, massive change if we’re going to deal with climate change. What I am uncertain about is whether this is the best strategy. As Legislative Chair of Virginia’s Sierra Club, the third panelist, Bob Shippee, said he works across the aisle in Richmond for what he sees as a bipartisan issue. Shippee said it is about helping lawmakers see that clean energy is good for businesses. BOB SHIPPEE: Why continue to subsidize these old energy sources that we know are polluting our environment, causing health issues and the like, versus giving the clean energy technologies a fair chance?